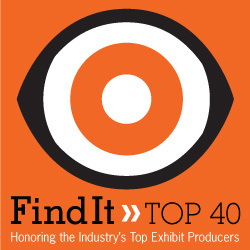 Exhibitor Media Group, the award-winning monthly magazine featuring best practices in trade show marketing, and Find It – Marketplace, the buyer’s guide to trade show products and services, recently announced the companies that qualified for the 2019 Find It – Top 40, which honors the industry's top exhibit producers with offices in the United States and/or Canada. More than 100 exhibit houses applied and were subjected to an exhaustive evaluation process including more than 50 individual criteria, all weighted to reflect how EXHIBITOR readers and Editorial Advisory Board members value them when vetting and selecting potential partners. The evaluation process also included a survey of current clients and a review of entrants' past projects, selling points, and innovations, conducted by corporate exhibit managers. The 40 firms who earned the highest scores qualified for this year’s list. Among them are 35 companies that are also members of the Experiential Designers and Producers Association (EDPA): 2020 Exhibits, 3D Exhibits Inc., Access TCA Inc., Acer Exhibits and Events LLC, ADEX International, Blue Sky Exhibits, BlueHive Exhibits, CenterPoint Marketing, CEP (Chicago Exhibit Productions Inc.), Classic Exhibits Inc., Condit Exhibits LLC, Creatacor Inc., Czarnowski Display Service Inc., Deckel & Moneypenny, Derse Inc., Elevation 3D LLC, Exhibit Concepts Inc., Exhibitpro, Exhibitus Inc., Freeman, GES (Global Experience Specialists Inc.), Group Delphi Inc., Hamilton Exhibits LLC, Hill & Partners, Impact XM, Kubik Inc., MC2 (Creative Management Services LLC), Mirror Show Management, Pinnacle Exhibits Inc., ProExhibits, RES Exhibit Services LLC, Skyline Exhibits, The Taylor Group, The Trade Group, and Zig Zibit Inc. The leader in trade show and corporate event marketing education, Exhibitor Media Group publishes the award-winning EXHIBITOR magazine, a monthly publication featuring best practices in trade show marketing. EXHIBITOR's learning events include: EXHIBITORLIVE, the professional development conference for trade show and corporate event marketers; EXHIBITORFastTrakaccelerated learning conferences; and EXHIBITOR eTrak, professional online learning. Exhibitor Media Group is also the founder and sponsor of CTSM (Certified Trade Show Marketer), the industry's only university-affiliated professional certification program. Learn more at www.ExhibitorOnline.com.